The Camnis HSC-200 is similar to the Albrecht AE600H, the Trident TR-2200 and the Commtel COM610. From the outside, this scanner shows some similarities with the Yupiteru MVT-7100. The receiver IC used is an MC3372, with the unfiltered audio on pin 9. 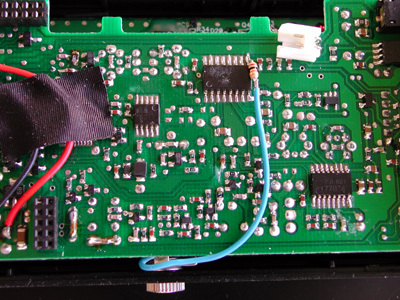 The 3.5 mm chassis part is mounted in the lower half of the scanner, below the IF PCB, as there is more room there. To disassemble the IF board, remove the two screws at the bottom end of the PCB. Remove the volume, squelch and dial knobs and loosen the washers with a pair of fine tip pliers. The ground contact of the socket can be connected to the metal shield of a coil nearby. 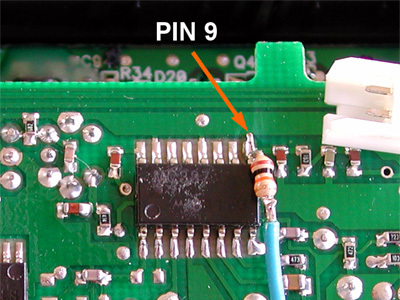 A 10 k resistor is connected to pin 9 of the MC3372. 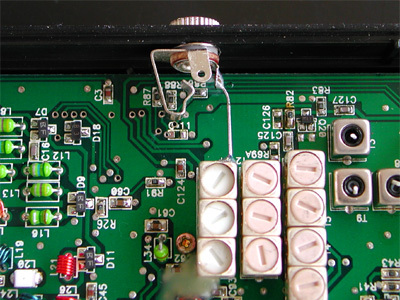 A short isolated wire connects the resistor to the chassis socket.